Bahrain embassy attestation is essential for those who plan to go to Bahrain for employment or study purposes.Embassy attestation is obligatory while applying for all types of visas like employment visa, family visa, student visa etc. Embassy certificate attestation is mandatory for Bahrain visas. If you are applying for an employment visa or have received an employment offer from Bahrain, you are required to submit necessary documents for verification. Embassy certificate attestation in Bahrain is compulsory for getting work permits. Likewise, if you are applying for admission to any of the educational institutions in Bahrain, you are required to submit all your educational certificates for attestation. HRD [Human Resources Department]: HRD attestation is mandatory for certificate attestation. Here, educational documents are verified from the respective state HRDs. MEA [Ministry of External Affairs]: After HRD, documents are submitted to MEA for attestation. For Bahrain, being a member of Hague Convention, one is required to get an MEA Apostille attestation. 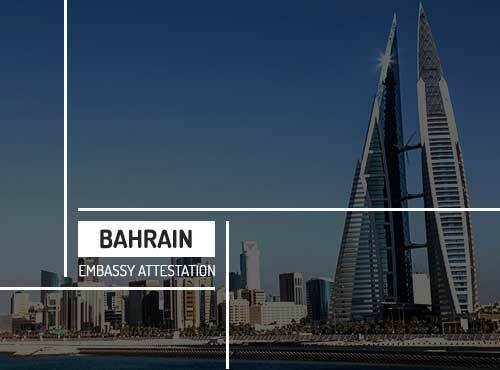 Embassy Attestation: Here, you have to submit the attested documents from HRD and MEA to the Bahrain embassy in your home country for verification. MOFA [Ministry of Foreign Affairs] Attestation: In the last phase, the attested documents from the embassy are forwarded to MOFA [Ministry of Foreign Affairs] Bahrain for final verification. To get resident permits in Bahrain. To get employment visa in Bahrain. For higher studies in Bahrain Universities. To start the branches of your business . Get business approvals and licences. The documents shall be subject to the type of visa you are applying for. For instance, if you are traveling to Bahrain for studies, you need to provide all your educational certificates for attestation purposes.